James F. Gaertner, right, SHSU president, congratulates faculty excellence award winners for 2005. 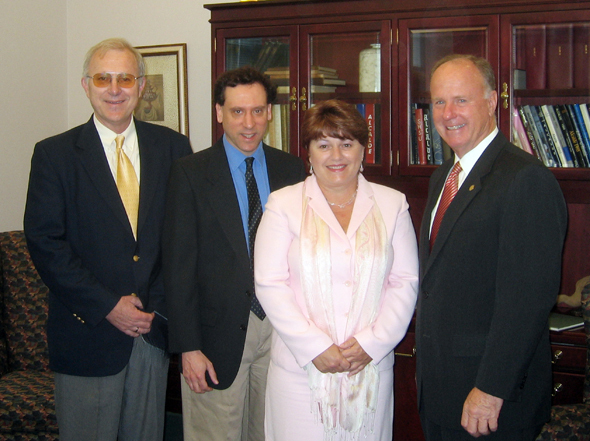 They are, from left, James S. Olson, David K. Marcus, and Debra P. Price. For the first time since excellence awards were established at Sam Houston State University in 1970, a faculty member has completed the SHSU academic grand slam. James S. Olson, distinguished professor of history, has been named the Excellence in Service winner for 2005. Olson won the Excellence in Teaching award in 1977 and the Excellence in Research Award in 1988. This year's winners also include Excellence in Teaching winner Debra P. Price, associate professor in language, literacy and special populations, and Excellence in Research winner David K. Marcus, professor of psychology. Each winner will receive $5,000. David K. Marcus came to Sam Houston State University in 1990, about a year after completing his Ph. D. at Clark University in Worcester, Mass. He received his bachelor's degree from the University of Chicago and his master's from Clark University. He is also a licensed clinical psychologist. He has compiled an impressive record of 32 publications in peer-reviewed journals, 30 of which have been published since he came to SHSU. Most have been in high impact tier 1 journals such as the Journal of Abnormal Psychology, Personality and Social Psychology Bulletin, Journal of Psychosomatic Research, and Journal of Consulting and Clinical Psychology. He works closely with students in his research, with 18 of his publications co-authored by one or more students. He has also presented 34 papers at national or international conferences, 20 of which have been at the American Psychological Association, the premier conference in psychology. 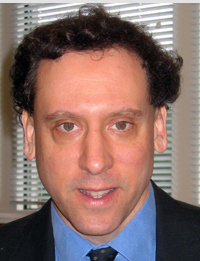 He also serves as associate editor of the Journal of Social and Clinical Psychology, is on the editorial board of the Journal of Counseling Psychology, and has reviewed more than 60 manuscripts for 11 different journals. Marcus has focused his research since coming to SHSU on interpersonal perception and processes in clinical areas such as depression, anxiety, psychopathy, and group psychotherapy. Some of his studies have involved prisoners. "These findings may have implications for the treatment of depression," said Marcus. "They suggest that social skills training in which depressed individuals are encouraged to interact in a positive manner with others may help alleviate the disorder." Some of his most recent work has involved the nature of psychopathy, how and if "psychopaths" are fundamentally different from "normal" people, and could have policy and criminal justice implications. 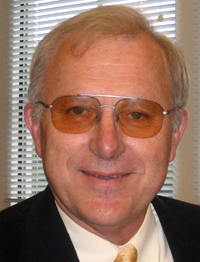 James S. Olson has taught at Sam Houston State since 1972, the year he received his Ph. D. from the State University of New York at Stony Brook. He received his master's there in 1969 and his bachelor's from Brigham Young University in 1967. While Olson has written more than 40 books on U. S. and world history, with many awards including nominations for the Pulitzer Prize in Biography and in History, he has also found time for a myriad of service activities for his students, fellow faculty members, and the university. At least 17 university faculty members have benefited from his advice on publishing projects and contracts. He has served twice as president of the faculty senate, twice as vice president, and was a member of the senate for six years. He has served on search committees for many administrators above the departmental level, on accreditation committees in 1979 and 1989, chaired a faculty merit review team from 1981-86, was on the University Budget Committee from 1984-87, and was on his college's Media Committee from 1987-97. Other efforts included faculty sponsor, Phi Alpha Theta, 1980-87; University Strategic Planning Committee 1984-89, Sam Houston Memorial Museum advisory board, 1986-90; Excellence in Teaching Committee, 1981-88, University Institutional Effectiveness Committee, 1982-85, and on the University Research Council, 1983-87. Olson was a valued adviser in the development of SHSU's freshman retention measures, he served on various committees for the National Council for Accreditation of Teacher Education in 1983, 1993, and 2003, and on the College of Arts and Sciences Ad-Hoc Committee on Research from 1997-2001. His service has been on a personal level with many of the more than 35,000 students he has known as a classroom teacher and history major adviser from 1987-2003. He has also taught approximately 75 uncompensated overload history courses and delivered approximately 2,000 uncompensated talks and lectures at the request of faculty, students, administrators and community leaders. He has received the Alumni Service Award (2003) and Sammy Award (2002), served as faculty sponsor of the Latter Day Saints Student Association for 33 years, and taught 66 uncompensated courses in the Institute of Religion. He also led the organization effort to build the Institute of Religion at 1108 17th St.
Debra P. Price earned her Ph. D. in from the University of Texas in 1996, the year she began teaching at Sam Houston State. She also earned special education-learning disability certification from the University of Missouri in 1986, her master's from Louisiana State in 1982, and her bachelor's from the University of Colorado in 1979. She has also taught in public and private schools in Louisiana, Missouri, and Texas, and a teaching assistant and assistant instructor at the University of Texas. During those years, she has developed a philosophy of teaching that she describes as "student-centered, but always with the idea that content matters." "No one benefits from criticism without suggestions for improvement…If a student needs a different approach to be successful, I'll try a different approach…I choose to learn with and from my students…Students need immediate feedback on assignments. They need me to show up on time, organized and ready for the tasks at hand…I would like my students to believe I am working just as hard at being a good teacher as they are at becoming one." Price has a number of publications, technical and research reports, grants, and paper presentations, as well as professional service activities, but faculty members and current and former students say her enthusiasm for the teaching profession is what makes her stand out in the classroom. "Most teachers neglect to share the passion for education--not this one!" "I am a successful educator because of this great woman…I admire and try to mirror Dr. Price's philosophy and love of teaching every day." "I have used her as a source of information even though I do not have her as a teacher any more and she always gets back to me. What a great example." "Dr. Price truly cares about her students and their learning and develops a relationship that lasts for years beyond the classroom." "Every day your enthusiasm and energy inspired me and made me want to RUN into a classroom, grab a book and teach kids to love reading and writing!" 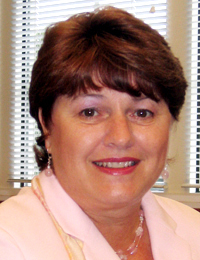 "I am aware that Debra has been nominated several times for this Excellence in Teaching Award," wrote a colleague. "I believe it is time for the committee to vote for her to receive the award."